Click on the picture above to see a short 10 second video of the start of the Keauhou-Kona Triathlon in Kona. If you don’t have QuickTime updated on your computer click on the QuickTime link to the right in the sidebar to get the latest software for free. A 1/2 Ironman distance triathlon this race had a clear blue sky during the race which made for a somewhat hot day. The course change was brutal for some as the run portion took a grueling uphill to the turn-around, then already tired legs had to strain to brake the running speed coming off the hill. Some of the world-class triathletes walked the hill as it proved to be punishing. 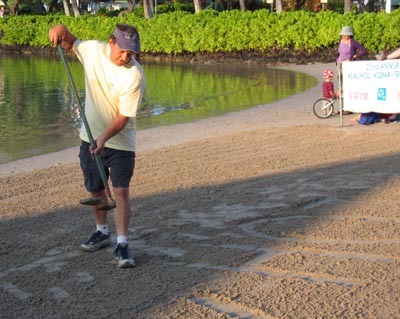 Chris rakes rocks out of the beach sand at the swim finish fronting King Kamehameha’s Kona Beach Hotel then spells out ALOHA in the sand for triathletes. hi,,I am trying to find the results of 1996 1997 keauhou race, I came in third.